Our Englewood law firm, Shapiro, Goldman, Babboni & Walsh, is home to eight highly respected attorneys. 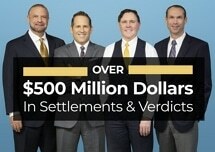 The partners in our firm, M. David Shapiro, David Goldman, Michael Babboni and Bernard F. Walsh, are four of Southwest Florida's most talented trial lawyers. They, with the help of the rest of our legal team, have tackled some of Sarasota and Collier counties' most difficult personal injury and wrongful death cases and succeeded, and they can help you as well. Regardless of the source of your injuries or loss, our attorneys at the law firm of Shapiro, Goldman, Babboni & Walsh can provide much-needed guidance and support as they help you pursue the personal injury or wrongful death compensation you need to ensure you and your family's future financial security. By taking advantage of our offer for a free initial consultation at our Englewood law office, you can learn more about how we can help you.